I could hardly contain my excitement as the plane approached Tahiti! It was ten years ago but I still remember it like it was yesterday. When I sat down to plan my round-the-world trip in 2008, a trip which quite literally changed my life, I took out a world map and circled the places I wanted to visit. 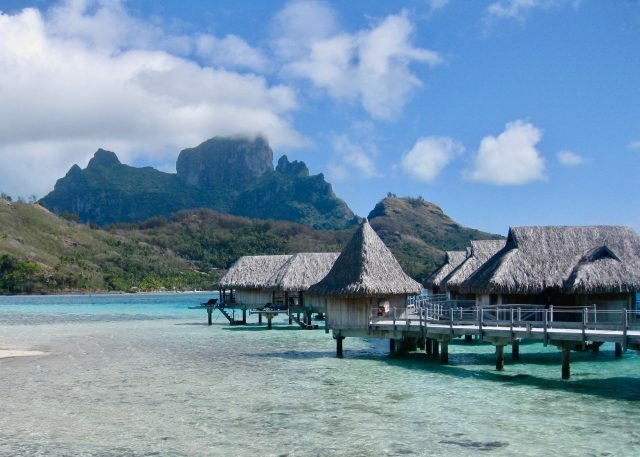 One place I certainly didn’t want to miss was Bora Bora, an atoll northwest of Tahiti in French Polynesia in the South Pacific Ocean (find Bora Bora on a world map). 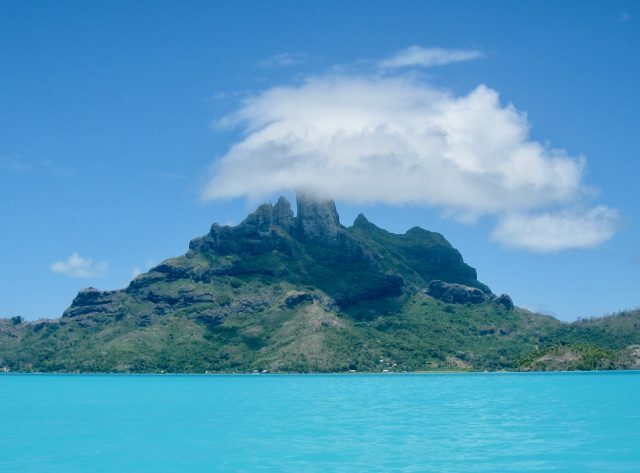 I was totally captivated by photos of Bora Bora I’d seen so many times in travel magazines and encyclopedias. 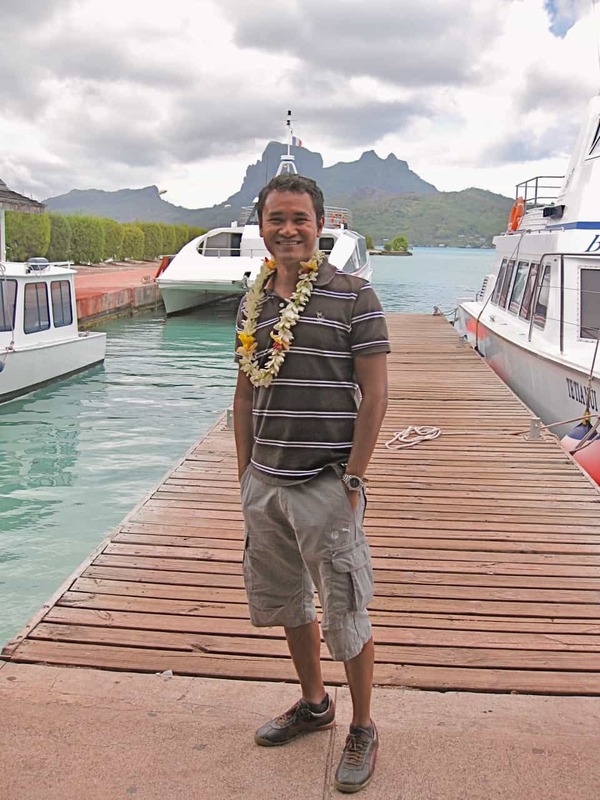 Whatever it cost, I was determined to visit this island paradise in the South Pacific – Bora Bora is not a cheap destination. Considering how far away it is and I knew I was going to spend a lot anyway, I decided to go all the way and splurge on an overwater bungalow at the Sofitel Bora Bora Private Island – a decision I didn’t regret one bit! The overwater bungalows were simply magical! 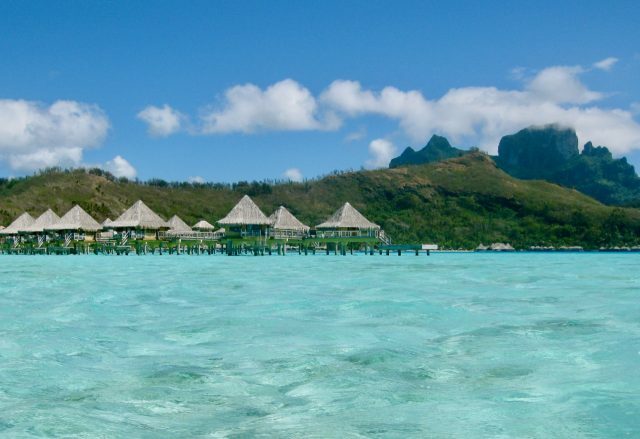 Bora Bora is everything I thought it would be… and more. I’ve seen pictures of it in countless publications, documentaries and travel programmes but it’s not till you’re actually here that you begin to fathom just how magical this place is. I mean, I’ve been to many places around the world that have similar surroundings but Bora Bora just has, let’s call it, the ‘X-factor’. I think it’s a mix of the lagoon’s breathtaking shades of turquoise, aquamarine, sapphire, emerald, fluorescent green and electric blue – you could spend a day or two here just trying to get your mind around the myriad of colours; the impressive rock face of Mt. Otemanu that towers over the whole lagoon; the crystal clear water and pristine white sandy beaches; the low-rise resorts (that give the place a very exclusive feel) with their idyllic thatched roof overwater bungalows; the constant scent of frangipani and tiare Tahiti (the national flower that’s used for almost everything); and the fact that you’re in the middle of the South Pacific! I can now understand why people are willing to spend a large chunk of their life-savings just to make a trip out here. It’s really like a little piece of heaven on Earth – I wouldn’t know how else to describe it. And it really was a little piece of heaven! I spent four glorious days in Bora Bora, most of the time just staring out at the immense lagoon and its breathtaking spectrum of colours, or snorkelling in the crystalline water below the bungalow. Just before sunset, I would sit on the deck of my overwater bungalow, with a cocktail in hand, and watch the little ‘migration’ of fish and sharks in the clear water below my feet. I had almost no idea of what to do in Bora Bora but I didn’t care. I had my deck and its incredible view! My arrival in Bora Bora. 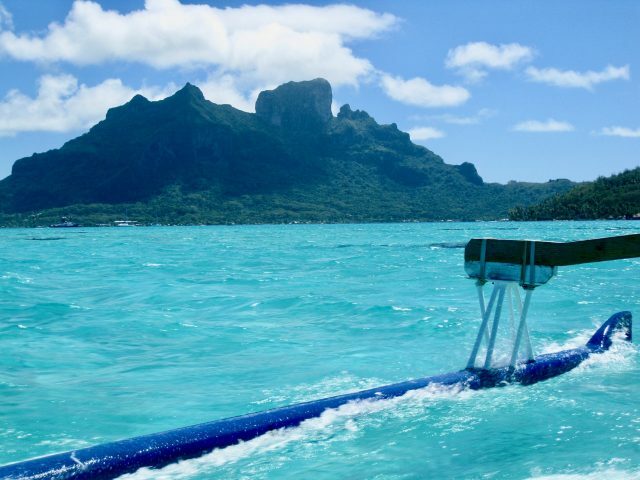 A boat whisked me to the the Sofitel Bora Bora Private Island, passing Mt. Otemanu along the way. I opted for an overwater bungalow at the Sofitel Bora Bora Private Island. And didn’t regret the big expense one bit! I would sit on this deck every day and just stare out at the colours of the lagoon. Ever so often, I would grab my snorkel and hop off the deck to see the colourful fish. 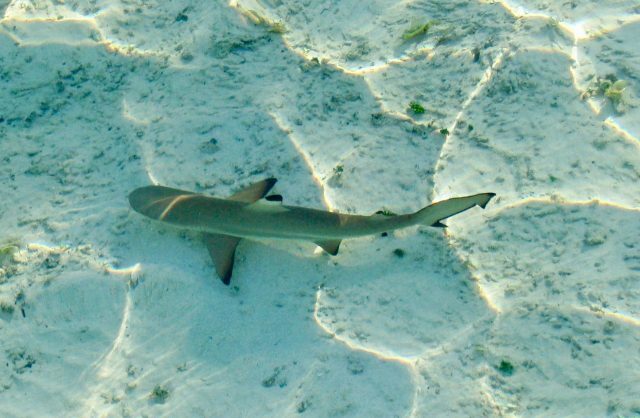 In the late-afternoons, just before sunset, I would sit on the deck and watch the many fish and baby blacktip sharks swim by. One evening, I climbed to the top of the hill of the private island for this stunning view. I managed to pull myself away from my bungalow for a boat excursion around the lagoon. I’m so glad I did! 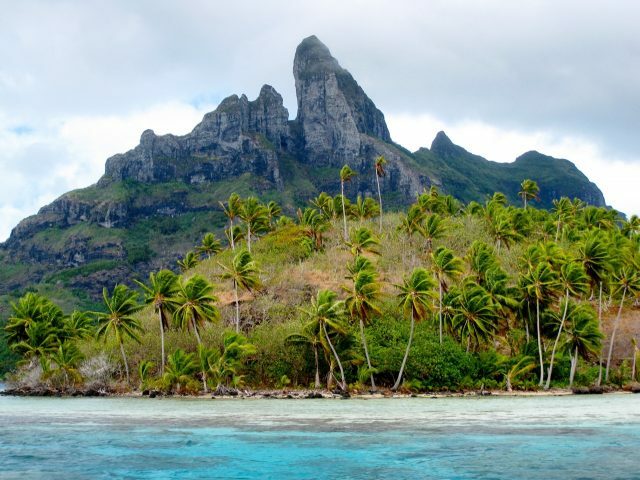 During this unforgettable excursion, I got to see some of the other resorts, swim with black-tip sharks and rays, and learn about Bora Bora’s coral nurseries. Views of the lagoon and Mt. Otemanu from the catamaran. Mt. Otemanu, touched by a cloud. Swimming with rays at an outer reef. It was an incredible experience to stand in the shallow water and watch these inquisitive creatures glide up against me and hover around. Bora Bora had one more surprise for me on the day I left. 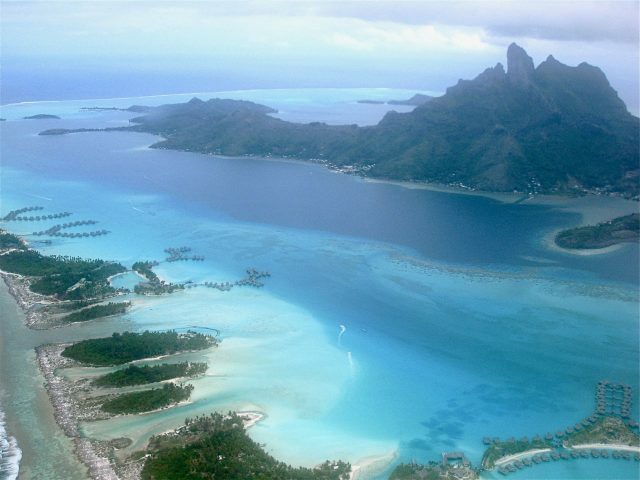 As the plane took to the sky, I was treated to a phenomenal aerial view of Bora Bora and its lagoon! The view quickly unfolded as the plane took off. My last glimpse of Bora Bora right before the plane flew into the clouds. Overwater bungalows in the Bora Bora lagoon. 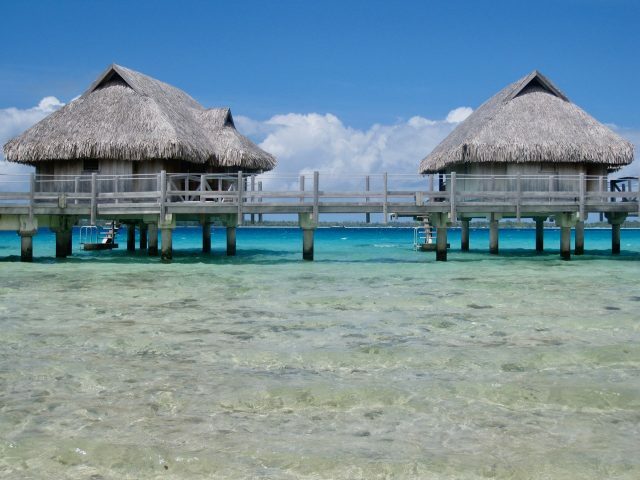 There are various high-end resorts in Bora Bora that have stunning overwater bungalows with views of the iconic Mt. Otemanu. 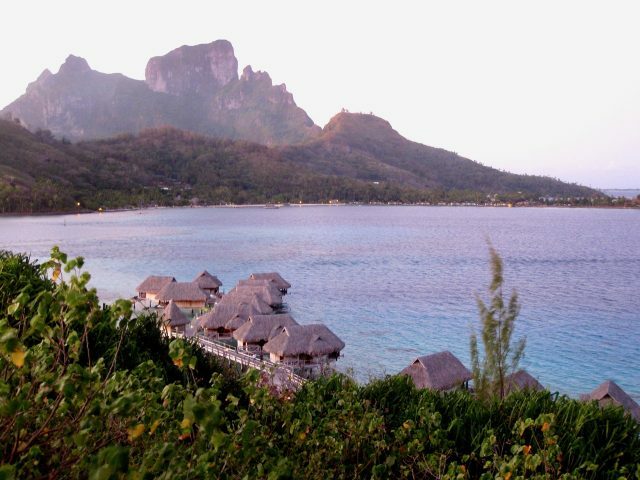 In addition to Sofitel Bora Bora Private Island, I recommend checking out the Four Seasons Bora Bora, Le Meridien, Intercontinental Bora Bora and St. Regis Bora Bora for spectacular views of the lagoon and Mt. Otemanu. On board Air Tahiti Nui (Business Class) from Sydney to Pape’ete. There are direct flights to Pape’ete, Tahiti, with Air Tahiti Nui from cities in Australia, New Zealand, Japan and the USA. 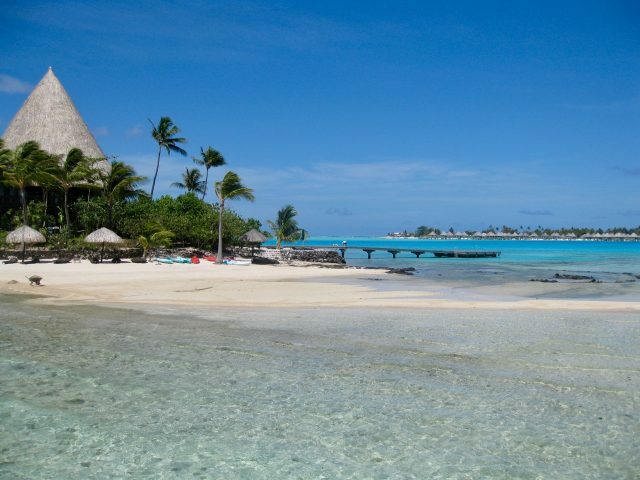 Air France & Air Tahiti Nui also fly from Paris via Los Angeles to Pape’ete. Latam Airlines flies to Pape’ete from Santiago, Chile, with a stopover in Easter Island. I flew to Pape’ete from Sydney, Australia. After my trip to Bora Bora, I continued on my round-the-world trip with Latam to Easter Island. 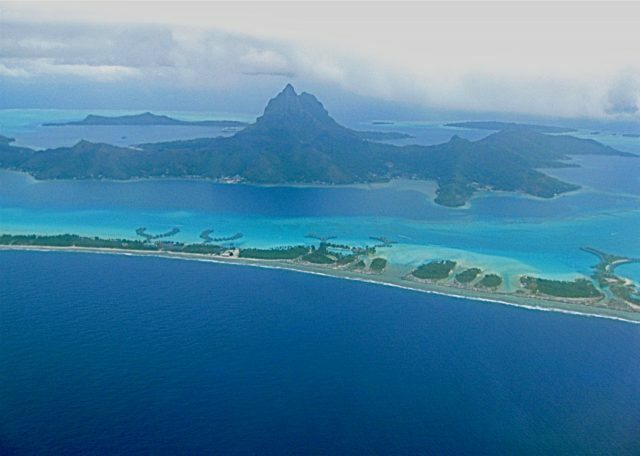 From Pape’ete, there are regular daily flights to Bora Bora. 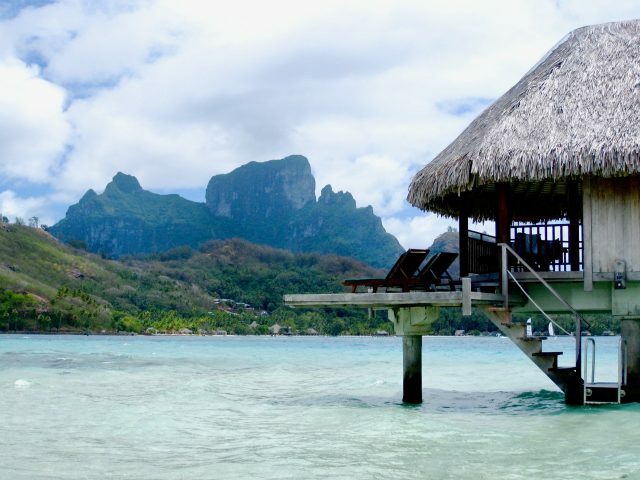 Bora Bora is such a little heaven. That is so picture perfect. I wish I could visit Bora Bora and swim in its blue lagoon. Nice pictures by the way! Amazing captures! Loved it. Thanks for sharing. I’ve heard great things about the Cook Islands. Would love to go there one day! That’s lovely Keith. We have been to the Cook Islands last year during our round the world trip and it is simply a stunning place full of people that are so relaxed and easy going. Guess Bora Bora would be just as nice.